There’s so much to see and do at Spectacular Jousting! 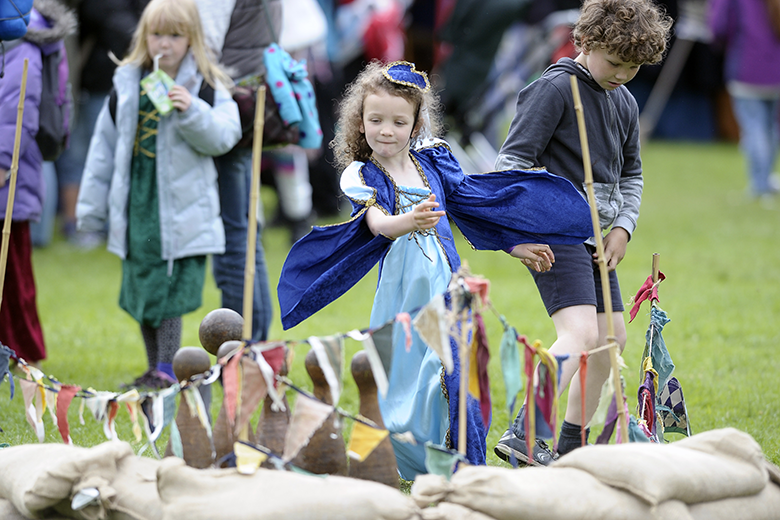 We reveal our top tips to navigating all the fun of the (medieval) fair at Linlithgow Palace. Do you have a case of Knight Fever? 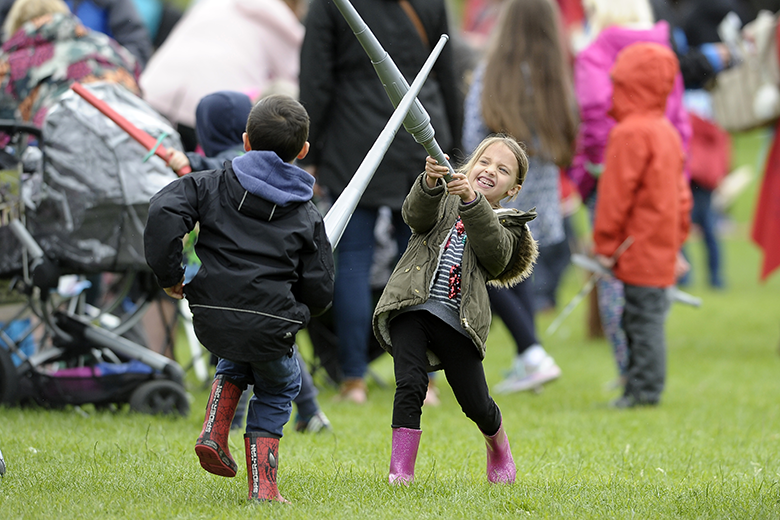 Treat your symptoms by coming along to Spectacular Jousting at Linlithgow Palace on Saturday 30 June and Sunday 1 July. Below are just some of the great ways to enjoy the event over the weekend. Spectacular Jousting is always a fantastic full day out for the family, and with the main jousts at 1.30pm and 3.15pm attracting the biggest crowds, we recommend coming along nice and early to avoid the queues and pitch up the perfect viewing spot. 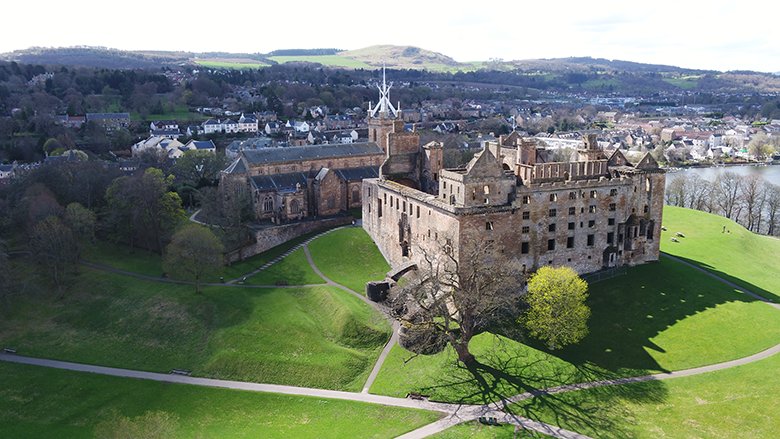 The site will be open from 9.30am, and it’s the perfect opportunity to explore Linlithgow Palace itself and enjoy the magnificent ruins of the birthplace of Mary Queen of Scots. Historic Scotland members – remember your membership card is your ticket to the event, please have them ready as they will be scanned on arrival for you to gain entry. Transport yourself back in time and explore our medieval living history camp. Meet medieval soldiers and watch amazing displays of falconry and archery. Don’t miss the tricks performed by the court jester, and get hands on with our junior jousting. 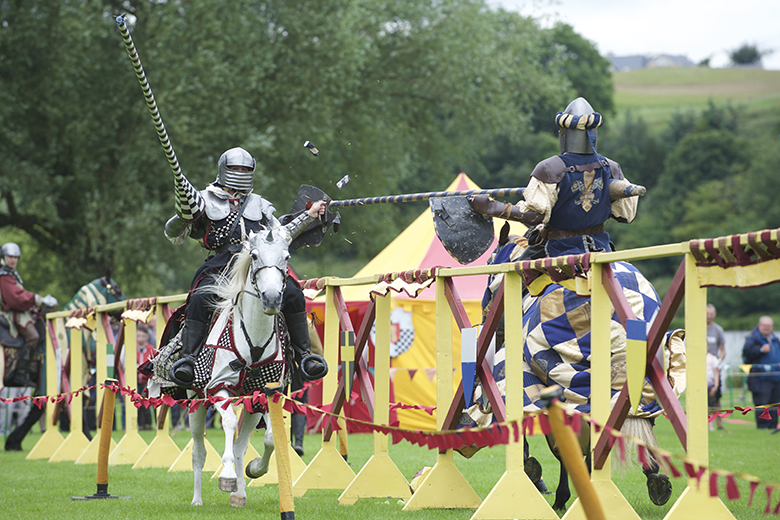 Do you have what it takes to be a great jousting knight? Are you on the side of Sir Checkmate Fitzpercy? Or more of a Sir James Ramsay fan? Whoever you wave your flags and cheer for, be sure to be arena-side and ready for the two main jousts of the day. 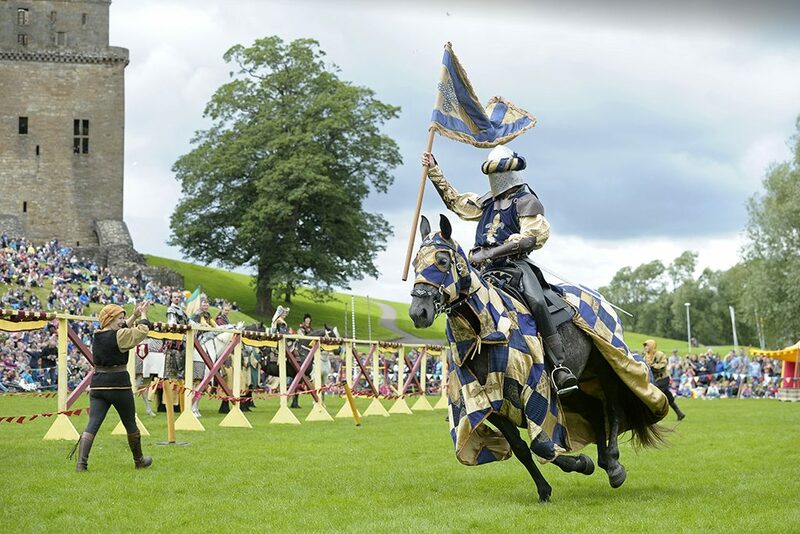 Hear the thunder of hooves and the clashing of lances as the noble knights battle it out to be crowned champion, in exhilarating showcases of this historic sport that was popular in the Middle Ages. Stay arena-side throughout the day for a range of fantastic performances in the foot area also. Be sure to come along nice and early to get your viewing spot, the site is open from 9.30am and the fun starts from 12.30pm before the first joust. Take a stroll around the event site and visit a range of teams from Historic Environment Scotland. We’ll have interactive activities for you to discover! 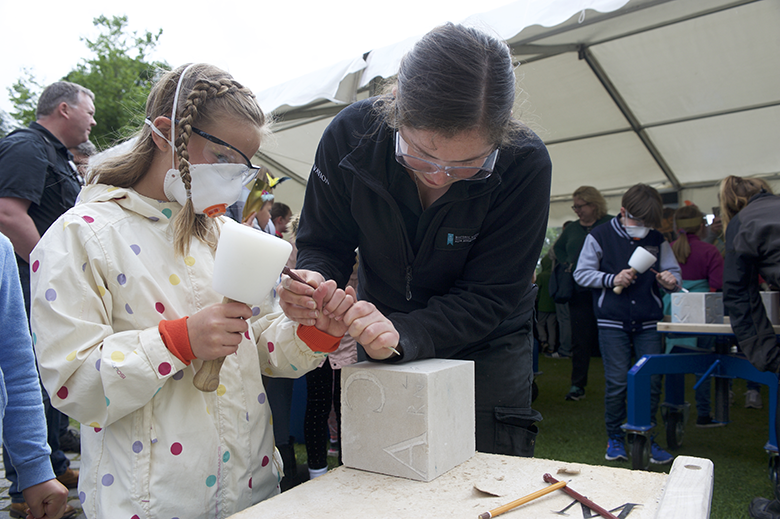 Have a chat with our collections team, technical outreach team, rangers and stonemasons. Enjoy meeting the horses in their stable, hearing entertainment from our musicians and having a go at period games. And be sure to get crafty and make your own pop-up castle! Brand new for 2018 – Look out for our ‘UStar’ Jousting photo booth, where you can become part of the action and get that all important shot of you in the role of your favourite Knight, ready to clash lances with your opponent. *Please note there will be an additional charge for this activity. 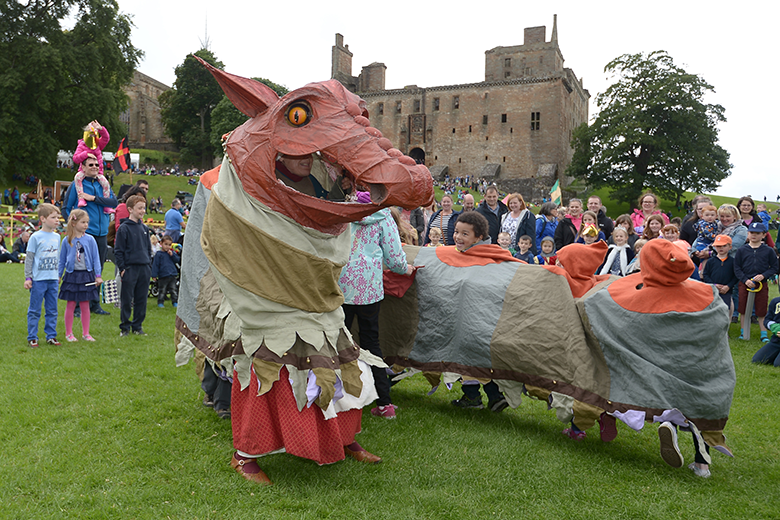 Spectacular Jousting takes place at Linlithgow Palace on Saturday 30 June and Sunday 1 July from 12.30pm – 4.30pm. Book your tickets online now. Can’t make it? Don’t worry! Spectacular Jousting will also take place at Caerlaverock Castle on Saturday 28 and Sunday 29 July. Both events are free for Historic Scotland members. Your membership card is your ticket, so please come along with it ready to be scanned for you to gain entry.